I am currently Maître de Conférences at the Université de Franche-Comté. During the last years, I was researcher at Inria, at the Poncelet Laboratory in Moscow and at the Universities of Heidelberg, Nottingham and Regensburg. I defended recently my Habilitation à diriger des recherches (HDR). Projects I am/was involved in. I am the local coordinator of the ANR Project FLAIR (Besançon/Bordeaux, 2017-2021), devoted to the study of L-functions in families. I take part to most of the Manta meetings. I joined the GRACE project for two years (2014-2016). I am part of the ANR Project Globes run by Jérôme Poineau in Caen. 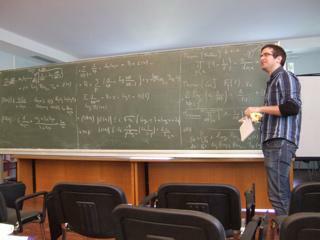 I organized the special year in arithmetic geometry in the French-Russian Poncelet Laboratory in Moscow (see the webpage). I was part of the DFG Project algebraic cycles and L-functions as researcher and postdoc. I was part of the EPSRC Project two dimensional adelic analysis as postdoc. P. Lebacque, Sur quelques propriétés asymptotiques des corps globaux, PhD thesis, Université de Marseille II (Mai 2007). P. Lebacque, On Tsfasman-Vladuts invariants of infinite global fields, IJNT 6 (2010),no.6,1419–1448. P. Lebacque et A. Zykin, Asymptotic methods in number theory and algebraic geometry, PMB 2011.